The Lady Bird Johnson Wildflower Center, home of Mr. Smarty Plants, is dedicated to the growth, propagation and protection of plants native not only to North America, but also to the place in which they are being grown; in your case, Central British Columbia, just west of the Alberta border. The castor bean is native to Africa. There is one member of the genus Astilbe native to North America, Astilbe biternata (Appalachian false goat's beard). If you follow that plant link to our webpage on that plant you will see that it is native to southeastern states in the United States. Younique Silvery Pink Astilbe, according to this article from Perennial Resources, was hybridized in Holland by Dutch gardener Jan Verschoor. This places both plants out of our realm of expertise. From Google are pictures of Astilbe biternata (Appalachian false goat's beard) and of castor bean. 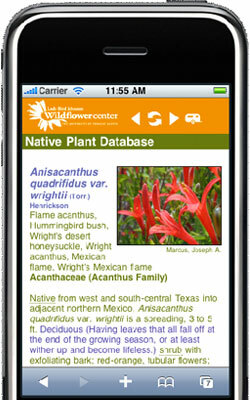 Since we have neither personal experience nor native plant information on these plants, we can only express an opinion. Our opinion is that the leaves of the hybrid Astilbe and the castor are entirely unlike, and there is only very little resemblance between the blooms of the two plants. It will be up to you and perhaps a local horticulture expert to figure out which (or what) you have in your garden. July 02, 2007 - I don't have a picture of a flower but I'm looking for a flower that I was told was called earthquake flower. It blooms at night. Could you help me?